Today is the 47th anniversary of the 1968 “Prague Spring” and the Soviet invasion. Brushing up on these events as it had been some time since I had read Central European Cold War history, I recalled a somewhat recent statement from our president on the issue of ISIS and their apparently eventual demise. Ideologies are not defeated with guns, they are defeated by better ideas and more attractive and more compelling vision. So the United States will continue to do our part by continuing to counter ISIL’s hateful propaganda, especially online. We’ll constantly reaffirm through words and deeds that we will never be at war with Islam. We are fighting terrorists who distort Islam and its victims are mostly Muslims. Know what really discredits ideologies? Unconditional surrender, occupying their capitals, wrecking their cities, defeating their armies. The fact of the matter is that liberalism without security will always lose to illiberal force. There is no contest. Security wins every time. There is no inevitable liberal future. The only inevitability that exists is one where chaos and illiberalism will clash against basic, common civilization. To pretend we will inevitably defeat foes such as the malcontents who comprise ISIS because we have “better ideas” is to willingly delude yourself. 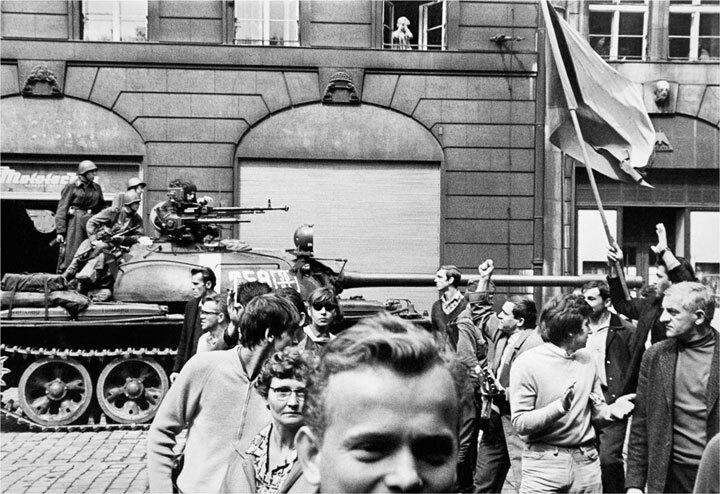 A recap of the Prague Spring will help disabuse ourselves of this absurd notion. The sluggishness of de-Stalinization under Antonín Novotný combined with a (predictable) economic downturn lead to increased instability as Novotný’s economic reforms increased demand for political reform, something he was not a strong enough leader to carry out. Literární noviny, the publication put out by the Union of Czechoslovak Writers, began suggesting(!) that writing not be subject to towing the Party line (perhaps anticommunism needed a safe space of its own?). Meanwhile, Brezhnev, seeing that Novotný could not keep control of his own Central Committee meetings, sacked him. He was replaced by Dubček as First Secretary and Svoboda as President. Dubček had his own “Secret Speech” moment as Eduard Goldstücker, new head of the writers’ union, took to public TV to openly criticize Novotný and his policies, in particular the lack of liberal reform. There was no state retaliation. Soon Literarni listy (now renamed) became one of the most popular periodicals behind the Iron Curtain. In short, he had discovered the value of the conservative, Burkean value of prudence and tradition. The mental and moral devastation through the ‘normalization process’ was the worst, even worse than the invasion itself. Moral cowardice became a prerequisite for private life, politics was seen as dirty and dangerous. It can’t be doubted that the ideas behind the Prague Spring were “better” than Soviet communism (or really, any communism, despite what young, western waifs behind their Apple computers will tell you). And yet they lost. The greatest contrast that demonstrates this poignant fact (and lesson if the president would heed it) is Hong Kong and the Republic of China (Taiwan). The fairly inspiring protests in Hong Kong, nicknamed the Umbrella Revolution, against the central, mainland, Communist control over local election candidates clearly had the better ideas. Responsible, local self government and market reforms. And yet, again, they lost. The student leaders, Alex Chow and Joshua Wong, have been officially proscribed and charged, and within a week, must report to the police. They will either face prison or, presumably, flee to a place where better ideas are in fact protected by guns. Compare this to the Republic of China. It is a place where a relatively free market, liberal civil rights and rule of law comfortably intersect. Yet how can this be as Taiwan is claimed by the People’s Republic of China? Simple. The ROC protects its better ideas with guns. It maintains the 16th largest active military, with over 2 million reservists and a policy of conscription. In fact the ROC has poured billions into both its navy and army in order to render a mainland Chinese invasion simply not worth the blood and treasure, to say nothing of spending millions more acquiring powerful friends and a qualitative military edge. The difference is brutally stark. In Hong Kong protesters get arrested, in Taiwan they bring about policy change and bring down political parties. Both have better ideas than the Chinese Communist Party, but only one has the means to defend those ideas. The president’s statements, while ultimately not meant as a serious policy (then again the US has no serious policy for securing our interests in the Near East), are helpful in showing the unconscious premises we often hold in politics. The good guys always win and ride off into the sunset. Why? Because they’re the good guys. Except when they don’t. In the real world, “the good guys” usually lose to the bad. Usually because the bad guys have better guns while having worse ideas. While such presuppositions are common, the fact they are common among those who are responsible for advancing our national interests and security is a bit discomfiting. The Intellectual Origins of the Prague Spring: The Development of Reformist Ideas in Czechoslovakia by Vladimir Kusin, 1971. Under a Cruel Star: A Life in Prague: 1941-1968 by Heda Margolius Kovaly, 1997. The New Right in the New Europe: Czech Transformation and Right-Wing Politics, 1989-2006 by Sean Hanley, 2008.